If Lorenz Metz grew up in Texas instead of Germany, he might not be playing football at the University of Cincinnati. “He probably would have been a guy that only a few schools have an opportunity to recruit,” said UC offensive line coach Ron Crook. “His potential is off the charts,” said head coach Luke Fickell. Metz grew up playing soccer and table tennis in Germany before being introduced to American football. After spending two years playing on the defensive line for the Kirchdorf Wildcats, Metz joined Premier Players International, an organization founded by former NFL player Brandon Collier to help European players earn NCAA scholarships. He chose Cincinnati over reported offers from Michigan and Georgia Tech among others. “I got offers from other schools but I liked it here the most,” he said. After arriving at Cincinnati last year, Metz was converted to offensive tackle. Metz only appeared in three games last season meaning he still has four seasons of eligibility remaining. Throughout spring practice he lined-up with the second string offense at left tackle. At the end of Thursday’s 15th and final spring practice, Metz blocked a field goal attempt to give his squad a win in a special teams competition. “I think it was his first time doing it,” said Fickell. “To win the game he puts his big paw up there and blocks the kick so it was really impressive. Make that a large one. Metz says he watched Sunday Night Football games at home in Germany. His favorite NFL team is the Philadelphia Eagles and his favorite player is J.J. Watt. His coaches say that the “German Giant” has NFL potential. “I couldn’t even begin to tell you what his upside is as he continues to figure this game out,” said Fickell. Michael Warren opened last season by running for 142 yards and three touchdowns in the win at UCLA. He ended it by earning MVP honors in the Military Bowl as he rushed for 166 yards and two scores in the victory over Virginia Tech. 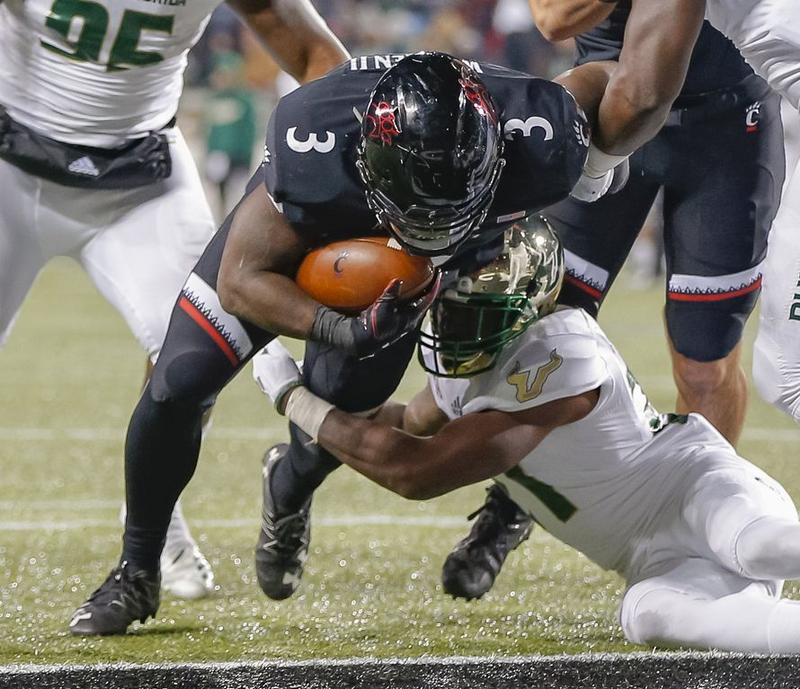 Despite missing the regular season finale against ECU with a shoulder injury, Warren finished the season with 1329 rushing yards – the third-highest single season total in Bearcats history and only 32 yards off DeMarco McCleskey’s record of 1361 yards set in 2002. Warren’s total of 20 touchdowns (19 rushing, 1 receiving) broke David Small’s previous record of 17 touchdowns set in 1993. As the Bearcats conclude spring football, I spoke to “The Truck” as he prepares for his junior season. Did you exceed your own expectations last year? You weren’t far off the school record for rushing yards in a season and you missed a game due to injury at the end of the regular season. Is that record on your radar going forward? You did get the single-season touchdown record. What did that mean to you? Last year you guys formed a three-headed monster and this year it could be four with the return of Gerrid Doaks. How competitive is it among you guys? How happy is your friend James Hudson to be here (a former high school teammate who transferred from Michigan)? Was your positive experience a big factor in James winding up here? I like watching you practice because you’re feisty. Is that a good word to describe your attitude? Do you have a chip on your shoulder? “I’ve always had a chip on my shoulder. I was overlooked in high school by a lot of colleges but Coach Fickell gave me a great opportunity to come here and I’m making the best out of it and doing the best that I can. I have a lot of people counting on me and you want to play with a chip on your shoulder. You don’t want to miss out on any opportunities. You know you’re great when they name a position for you. In 2019 the Bearcats offense will include the “K-position.” The K is for Kelce – as in former UC star Travis Kelce who has topped 1,000 receiving yards in each of the last three seasons for the Kansas City Chiefs. The current Bearcat expected to get the most snaps at the “K-position” is senior Josiah Deguara who had 38 catches for 468 yards and 5 touchdowns last season. But the future of the spot could belong to redshirt freshman Josh Whyle. The highly-touted recruit out of La Salle High School was expected to play a significant role last season before breaking his collarbone while attempting to make a catch on the third day of preseason camp. Whyle missed the first eight games of the season before making his college debut on November 3rd vs. Navy. The 6’6”, 230 pound tight end only played in four games including the Military Bowl win over Virginia Tech meaning that Whyle can take advantage of the new rule instituted last year that allows a player to participate in up to four games and still qualify for a redshirt season. 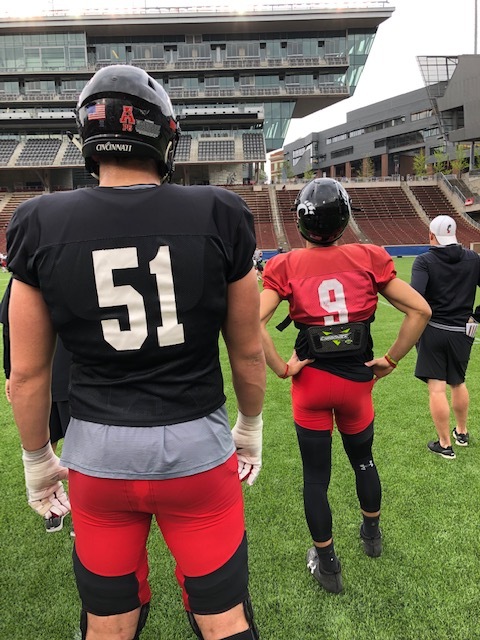 Over the past few weeks at spring practice, the Bearcats offense has frequently featured multiple tight ends from a talented group that includes Deguara, Whyle, Bruno Labelle, Wilson Huber, and Leonard Taylor. Whyle is likely to be a valuable weapon in the passing game while playing the “K-position” this year. Whyle’s potential was evident from his list of more than 30 scholarship offers including such schools as Auburn, Georgia, Tennessee and Wisconsin. After playing for an 11-2 team last season at Cincinnati, he’s thrilled with his decision to stay close to home. Mick Cronin is the most competitive person I have ever met in any walk of life. He’s been my friend for roughly 20 years. We’ve celebrated memorable wins together, shared a ton of laughs, enjoyed great meals, and traded parenting tips since our kids Sam and Sammi were born about five months apart. When he would come out of the locker room to do the postgame radio interview, it seemed like his entire body was clenched like a fist. The tension was palpable as he seethed about what went wrong. Additionally, members of his staff would privately joke about how miserable things were going to be the next day. That competitive fire didn’t only show up after losses. On the day of a game he couldn’t eat until it was over. To me, that helps explain why Mick is a tremendous coach and did such a remarkable job in restoring Bearcats basketball to its place among the most successful programs in the country. He’s a lifelong student of the game and a brilliant defensive tactician. But first and foremost, he demands effort. And his teams reflect his hypercompetitive personality. Another key to his success if that Mick has the courage of his convictions. While he was always self-evaluating and trying to improve every aspect of the program, his core message never changed. It certainly worked at Cincinnati where Mick won 296 games in 13 years, made nine straight trips to the NCAA Tournament, captured back-to-back AAC tournament championships, and won 89 games over the past three seasons – the winningest three-year stretch in school history. But it might surprise you to know what accomplishment meant the most to him. At our final weekly radio show of the year – the day after the conference tournament win over Houston – Bill Koch from GoBearcats.com asked Mick to reflect on the job he had done in revitalizing the program after the messy departure of Bob Huggins. Mick Cronin leaves the program in great shape. With the $87 million dollar renovation of Fifth Third Arena, a talented roster in place, and a great academic track record, there will be no shortage of coaches eager to take his place. Since becoming athletic director, Mike Bohn has made home run hires in Luke Fickell, Michelle Clark-Heard, and Scott Googins among others, and I am excited to see who he lures to replace Coach Cronin. I am also excited to see how Mick does at UCLA. I have no doubt that the same formula that won big in Clifton is going to work wonders in Westwood. Most of all I am grateful for our friendship and appreciate all he’s done for Bearcats basketball. It was fun to have a front row seat. When Sean Kilpatrick was playing for Notre Dame Prep in Fitchburg, Massachusetts I was living about an hour away in Boston. After he signed to play for UC, I braved a massive snowstorm and drove to one of his prep school games to see Sean play. Kikpatrick’s coach assured me that it was just a rare bad game and that Sean would have an outstanding career at Cincinnati. I did not have a similar experience when I went to watch future Bearcat Samari Curtis. In mid-February when Cincinnati had a week between games, I took a peek at the Xenia High School schedule in hopes of seeing the 6’4” guard in action. Fortunately, the Buccaneers had a road game in the Dayton area, so I made the trip up I-75 and when I walked into the gym I spotted Coach Cronin in the stands. Together we watched Curtis put on quite a show in an 86-72 win. Despite being held to three points in the first quarter, Samari finished with 42 points and went over the 2000 point mark for his high school career. Curtis had a school-record 52-point game this season, averaged 34.4 points a game, and finished with 2,109 career points. On Thursday he was named Ohio’s “Mr. Basketball” for 2019. That award has existed in Ohio since 1988 and Curtis is the first Cincinnati recruit to win it. The most impressive aspect of Curtis’ game the night I watched him play was his ability to drive toward the basket at high speed with either hand, abruptly hit the brakes, and softly float in a mid-range jump shot. For the season, Curtis shot approximately 52% overall, 33% from outside the arc, and 77% from the free throw line. He also averaged 5.8 assists to rank second in the Greater Western Ohio Conference. Curtis verbally committed to Xavier in February of last year, before reopening his recruitment and signing with Cincinnati in November. Coach Cronin is hoping that Curtis can contribute right away next season. Curtis says he is looking forward to getting to Cincinnati and getting to work. His top-listed freak last year was Penn State running back Saquon Barkley. A few years ago it was SMU defensive end (and eventual Bengals draft pick) Margus Hunt. This year, Feldman put out a list of the Top 50 college football freaks for The Athletic and it includes Bearcats safety James Wiggins who is 33rd on the list. Wiggins was flattered to be included on a list of the top physical freaks in college football. “He’s one of the freakiest kids I’ve ever seen in my life,” said Collins. Wiggins says his teammates have started calling him “Freak,” but Collins prefers a different nickname. Wiggins redshirted in 2016 and saw limited action in 10 games last season – mostly on special teams. Wiggins played wide receiver, quarterback, cornerback, safety, and outside linebacker in high school and credits safeties coach Jon Tenuta for helping him grasp the finer points of secondary play. Wiggins and fellow sophomore Darrick Forrest have been the safeties on the first-team defense at training camp. Wiggins could be a fixture in the Bearcats secondary for the next three seasons, meaning he also has three years to climb Feldman’s list of the top physical freaks in college football. So how high could he go? One of the first lessons that athletes receive in youth sports is to never quit. 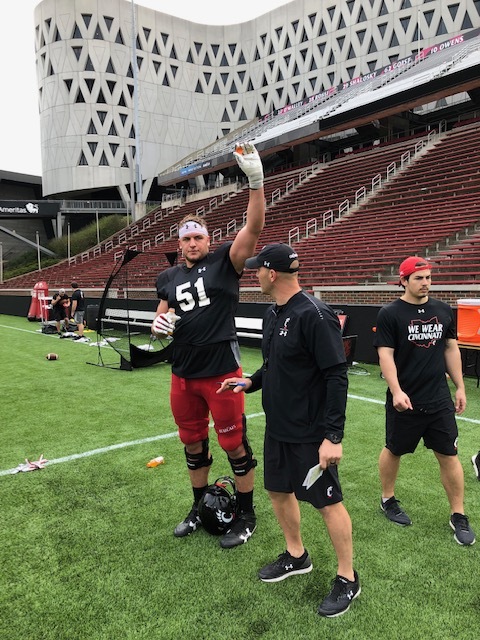 But two seasons into his UC football career, Garrett Campbell was told by athletics trainer Bob Mangine that he should consider quitting due to knee and back injuries. For the former St. Xavier High School standout the answer was yes. “I love the game of football and I couldn’t turn my back to it,” Garrett told me. “I talked to my parents for a while and we all decided that it wasn’t time for me to leave yet. Bar none, it was the greatest decision I’ve ever made. Since his injuries prevented him from playing in his first two seasons at Cincinnati (2013-14), Campbell has been granted a sixth year of eligibility by the NCAA. He was recently named to the watch list for the Allstate/AFCA Good Works Team and the Wuerffel Trophy, two awards which recognize players for the on- and off-field contributions to their school and community. Campbell joined the Bearcats as a preferred walk-on before being awarded a scholarship prior to last season. His return for a sixth year means that the Bearcats will have a veteran back who started every game at left guard last season. When the 23-year-old arrived at UC, he wasn’t sure that he would play at all. Campbell is also a success story off of the field. He earned his undergraduate degree last December and posted a perfect 4.0 GPA in the spring semester. But first he has a sixth and final year of college football to look forward to. “My first couple of years were hard,” Garrett told me. “I’ve had three different offensive line coaches here and two head coaches. That’s been difficult and a blessing for me. All of the coaches bring in a lot of great stuff that I can pick and pull from to develop my technique. But the downside is changing every year and re-learning a coach and his system. Under some I thrived and under some I didn’t. Under the ones I didn’t, it was a grind. I was really in the pits and didn’t love football at the time. But I knew that it wasn’t time for me to quit. I knew that there was a pot of gold at the end of the rainbow. So I knew that I had to keep pushing through it and when Coach Crook came, it was that pot of gold. It’s been an unbelievable experience and I’ve really connected with him. He’s a great coach and a great guy and for me it was a turnaround.